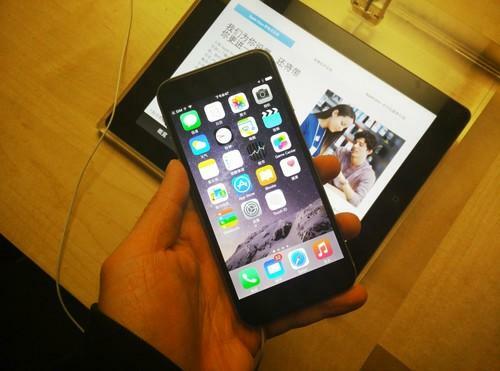 The Apple iPhone 6 at a Beijing Apple Store. Sales of Android smartphones were up in the first quarter but its share of the market fell, while that of iOS grew for the third consecutive quarter. Overall, the market grew 19.3 percent year on year, with 336 million smartphones sold to end users worldwide, according to Gartner. Android's share fell by 1.9 percentage points to 78.9 percent, while iOS grew from a 15.3 percent share to 17.9 percent. The year-on-year changes hide an even sharper short-term fall for Android, from 83.1 percent in the third quarter last year, and a stronger rise for iOS, from 12.7 percent before sales of the iPhone 6 took off. China was a key battlefield during the first quarter, as strong iPhone sales had an impact on Android's performance in that country. Android's volumes fell by 4 percent year on year in China for the first time, according to Gartner. On Tuesday, IDC offered its take on what the future holds for the smartphone market, and said the developments during the first quarter are likely to continue. This year, for the first time, Android will grow more slowly than overall smartphone sales, the market research company said. There are more reasons than just a slowing sales growth for Google to worry. Up and coming smartphone makers -- such as Lenovo, Huawei Technologies, Xiaomi and Micromax -- are using interfaces that stray far from the stock version of Android. At the same time competition over the services that these smartphones come with is increasing. So, Google wanting to expand Android to other platforms, such as cars and TVs, isn't a surprise from that point of view. This doesn't necessarily mean Apple will become the biggest smartphone maker in the world on a permanent basis. The worldwide smartphone market is still expanding due to growth coming from sales of low and mid-range smartphones in emerging markets, so it's not going to be easy for Apple to take a leadership position while only focusing on the premium market, Gupta said. Of course, all this doesn't prevent Apple from making a ton of money. The company made a US$13.6 billion [b] profit during its last quarter, in large part thanks to iPhone sales. Besides Apple, LG Electronics, Huawei and Xiaomi all had good first quarters. Trying to make operating systems successful in the shadow of Android and iOS continued to be very challenging during the first three months of the year. Sales of smartphones running Windows Phone increased to 8.3 million [m] during the period. But that wasn't enough to keep up with overall growth, so the its market share dropped from 2.7 percent year-on-year to 2.5 percent. Microsoft is hoping to give mobile sales a boost with Windows 10, which will offer a more consistent user interface across all types devices. BlackBerry continued to see smartphone buyers ignore its products and OS. The company sold 1.3 million [m] smartphones, which was enough for a 0.4 percent market share. During the first quarter last year, BlackBerry sold 1.7 million [m] smartphones for a 0.6 percent market share. If that downward spiral continues, and there are few reasons why it wouldn't, Blackberry CEO John Chen won't be able to keep selling hardware whether he wants to or not. Even though BlackBlack struggled, it still managed to sell more devices than the operating systems collected by Gartner in the "other OS" category, which include Samsung's Tizen and Mozilla's Firefox OS. Neither company seems ready to give up, but selling less than 1.3 million [m] units together doesn't bode well for the future. With the features and core capabilities becoming increasingly similar, it's now critical for OS developers to find ways to differentiate themselves. They need to extend their ecosystem's reach by adding new functionalities, and build platforms that can span multiple devices types, according to Gartner.